Synthplex 2019: Rossum Electro-Music has released the Mutating Spectral Resynthesizer Eurorack module at the inaugural Synthplex event in Burbank CA. The module is the brainchild Bob Bliss, designer of E-MU’s Emulator OS, and promises a veritable shed-ton of sound designing tools. The MSR's main purpose is to analyse the spectral content of any audio signal, which is then used to drive a bank of 1-33 oscillators. Just in case you didn't think that was enough, it can also modify the input, in realtime, in myriad ways. The module’s input can take on anything that's thrown at it, from the simplest of waveforms to full-on mixes with vocals. 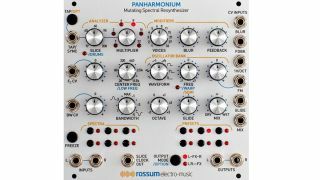 In addition to this, Panharmonium is able to take a snapshot of the incoming signal spectrum and use it as its own oscillator, which can then be fed through the modifier controls. All of this is crammed inside a 26HP, 25mm deep Eurorack module, that will no doubt become a firm favourite among sound designers. The module will be available in the summer for $499. For more information, check out the Rossum Electro-Music website.